Yesterday, the good news was there is no traceable form of cancer in any other bones. That was a huge relief. Tonight’s test (8:10PM) is the second crucial test. It is a CT scan of her chest to see if the cancer has spread to the lungs. Apparently, about 25% of the time, it spreads there. We are praying the test comes back negative. 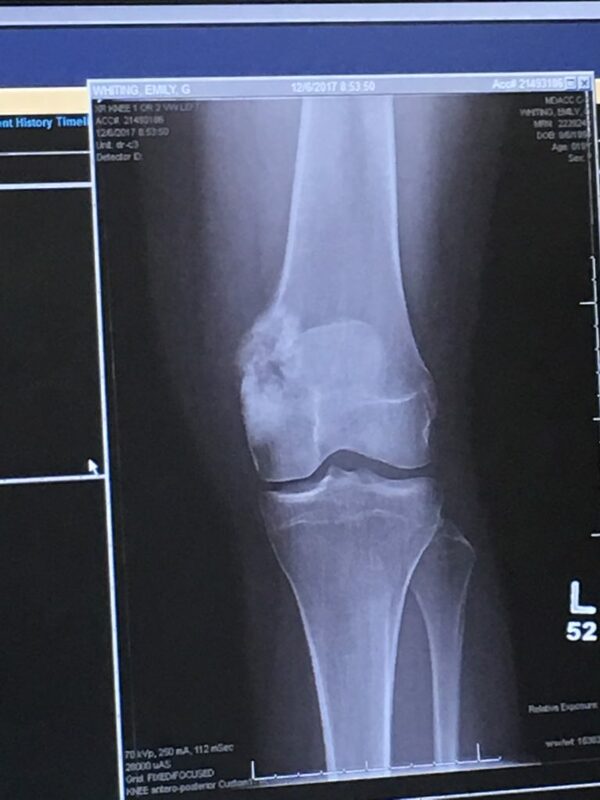 The picture above is what started this process – an X-Ray of her knee. You can spot the tumor pretty easily. Today, she’s had many meetings and tests, and now we are just waiting for the CT scan. Tomorrow morning is the biopsy. It seems like it could be an open biopsy rather than with a needle. They will decide once they get in there. As soon as that is over, the surgeon will look at it through a microscope and know a lot more. There are more appointments and consultations after surgery tomorrow. Then we look forward to a quiet weekend at home. Tonight, we hope to be done by midnight. Tomorrow, we have to be here by 5:30 AM. We had our first hospital visitor tonight – an old friend from Rochester, Maria Connor. It was great to visit for a couple of hours while we wait for the CT scan. She brought us dinner and prayed for Emily. And now, we continue to hurry-up and wait. To see the first two updates – go to davidwhiting.org. You can see updates and subscribe there if you want to receive emails of updates. 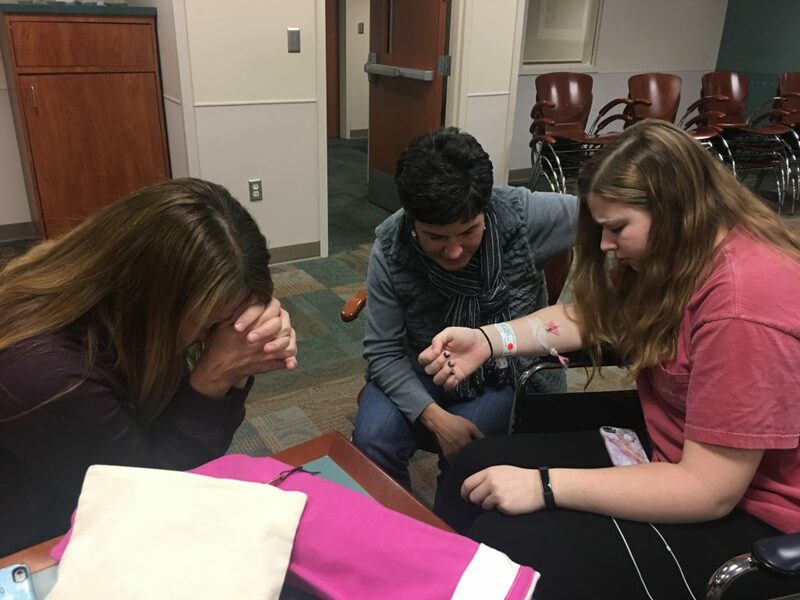 Appreciate updates – helps us pray specifically…I remember someone giving me Psalm 138:8 out of the KJV when I was in college and I have hung on to it since then…”The Lord will perfect that which concerns me” – praying that God will give healing AND peace to know God will perfect that which is hitting you right now. Continuing to keep you all in prayer. Last night when I was telling my husband, I couldn’t help noticing that you are in Texas, home of MD Anderson, one of the top 5 cancer centers in the country. I have been thanking God for that, for His perfect plan that has you in that city at this time. Thank you for the updates, keep them coming! They will one day be a great testimony of God’s miracle in your families lives. My heart aches for Emily and your family. Praying hard. My mom and I are doing a bible study on the books of Acts and it’s renewing my faith in the power of prayer. We are all banned together in prayer and the light is so bright here in Rochester with prayer for your Emily!!!! God hears us. We are loud and strong for her. Enjoy a peaceful weekend with a lot of dark chocolate and laughter.